What an honour it was to attend the Aboriginal Literacy K-12 Symposium at UBC in the gorgeous First Nations House of Learning. Squamish Chief Ian Campbell was a captivating storyteller who demonstrated the power and importance of oral storytelling, and encouraged us to look more critically at the colonial lens through which we teach and live. Musqueam Elder Larry Grant explained what unceded territory means and the important of acknowledging the traditional territory of the land we are on. 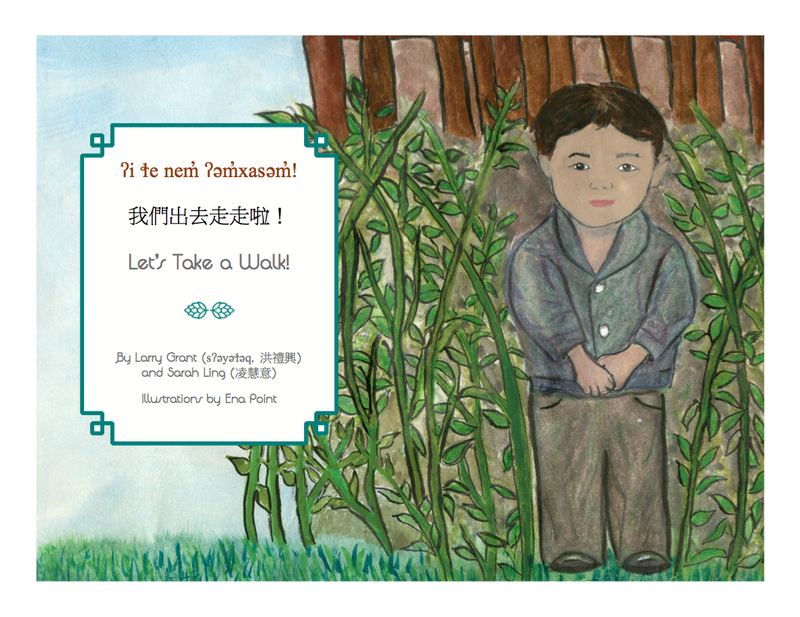 Larry Grant shared his published picture book, Let’s Take a Walk, co-authored by Sarah Ling and written in three languages: hən̓q̓əmin̓əm̓, English and Chinese, as part of UBC’s First Nations Language Program and Oral Traditions Project. UBC offers courses in hən̓q̓əmin̓əm̓. Let’s Take a Walk, is a memoir of Larry Grant’s childhood, growing up with a Musqueum mother and Chinese father. School District #37 Delta circulated a wonderful resource Weaving Aboriginal Perspectives into the Curriculum, that include ’10 Ways to Weave Aboriginal Ways of Knowing into Classroom Curriculum, First Peoples Principles of Learning,and Place-Based Thinking Concepts. http://oyate.org/ Are your resources appropriate and authentic? Check out this site’s book reviews. http://firstnationswriter.com/ Cree author Larry Loyie and partner Constance Brissenden promote writing in First Nations communities. http://americanindiansinchildrensliterature.blogspot.ca/ Debbie Rees reviews many, many books. http://www.goodminds.com/top-picks Book lists and other teaching resources for sale. http://books.bc.ca/wp-content/uploads/2014/11/AbCat2014_Final_web2.pdf Canadian Aboriginal Books for Schools published annually. Great resource. Poster available. http://portal.acc-society.bc.ca/literacy/childrensbooks BC Aboriginal Child Care Society’s literacy page with book recommendations and teaching resources. https://www.portageandmainpress.com/lesson_plans/plan_286_1.pdf Teaching guide for 7 Generations series, an excellent graphic novel depicting the story of a young man who struggles with his past. http://thehealthyaboriginal.net/contact-us/ Graphic novels, posters and video on health and social issues for young people. French and English. http://rabbitandbearpaws.com/ Series of funny graphic novels that are appropriate for elementary school students. http://www.kids-bookreview.com/2013/07/book-list-picture-books-by-indigenous.html Lists of book reviews, this particular link provides a list of books written by Indigenous people of Australia. http://www.firstnationliteracy.com/ Teaching resources, including book recommendations and lesson plans.